Is it a Papuan Frogmouth Owl? adrian ss wrote: Guess what this is. 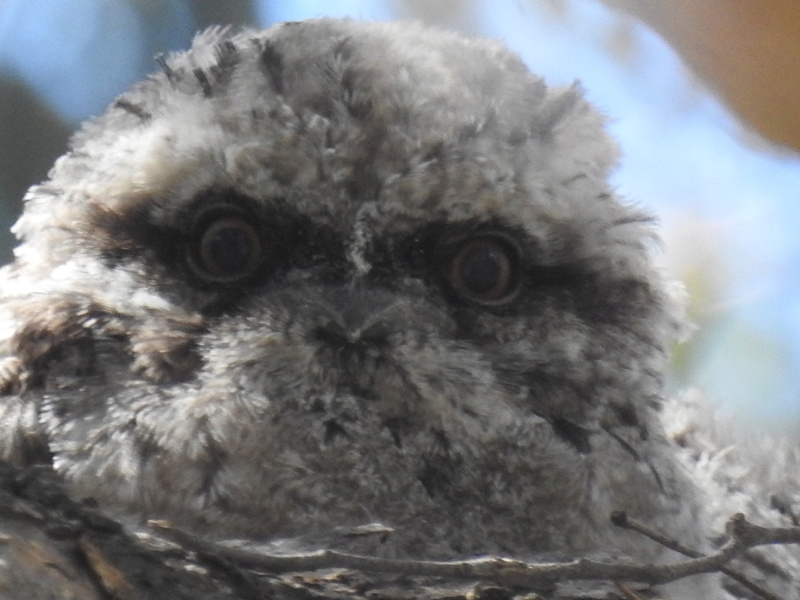 Too easy, nestling Tawny Frogmouth. Feeling humorous tonight hey Jen. Yeah Reg a young tawny. Funny looking as a hat full of bums those critters. Yes Adrian, found one blown out of a nest when I was a kid. Could not find the nest, so raised him to adulthood. Never clipped his wing, and he perched in our apricot tree until one night the call of nature took him away. Broke my schoolboy heart, but about a year later he turned up with a mate as if to say goodbye. Never saw him again. We now see them on our property, and they bring back my memories of 'Tawny'.. This little fella is part of a family that lives in an old gum tree near my sisters place. The adult pair have been there for several years and have raised several sets of chicks. They don't make much of a nest but it has been in the same spot for years. The currawongs give them hell but those adult birds are fierce protectors. We rescued one chick that fell out of the nest and placed it back on a branch fork and it proceeded to clime back up to the nest. The adults took a dim view of our touching the youngster and came at us like stealth bombers, but now they do not pay us much attention. adrian ss wrote: Feeling humorous tonight hey Jen. Are you prepared for tomorrow night Adrian? Last one was when we were still pooping our pants. Socked in with cloud at my place in Melbourne, so I hope that someone has been able to capture a few good shots of the Super-moon. Every time an event comes up.. those damn clouds come and spoil it! The Super Moon over Canberra. Looks a bit brighter tonight but otherwise like any other moon. 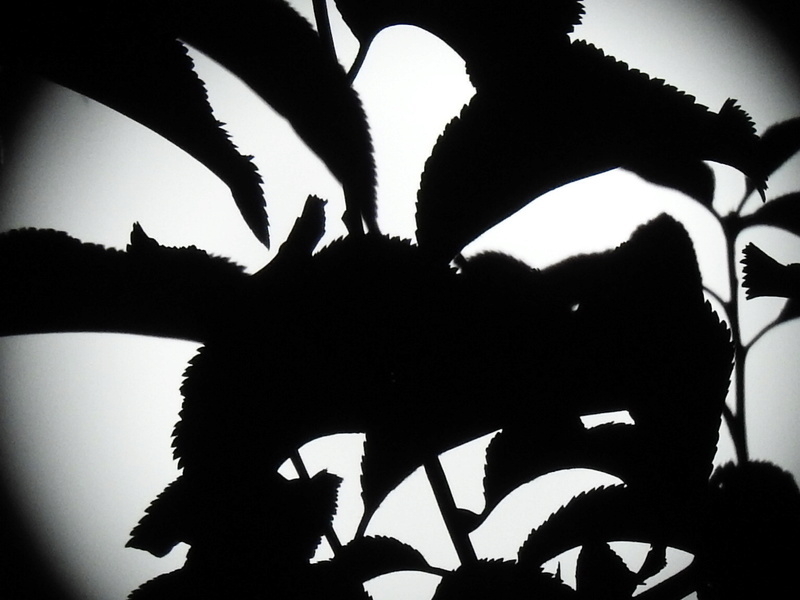 Some sharp eyes may spot a few foreign dark spots on the moon. They are clouds between my cam and the moon. Thanks Adrian a super shot of the Super moon. Wow Adrian.. thats a great photo..
Thankyou... for sharing with us all..
but we did look at it through star gazing binoculars..
Geez its bright, and BIG.. 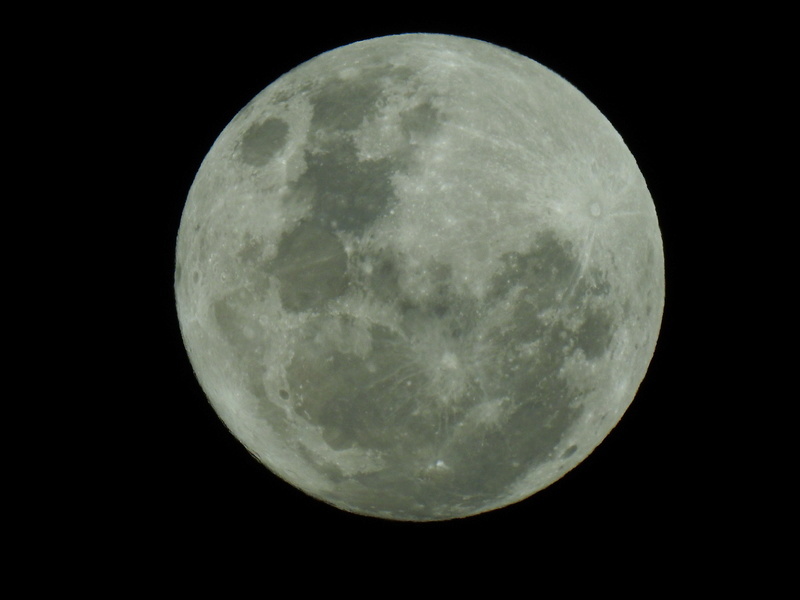 Thanks Adrian, great shot of the super Moon. You can get some very nice pics with your camera. So thanks again for sharing them. Mike54 wrote: Thanks Adrian, great shot of the super Moon. You can get some very nice pics with your camera. So thanks again for sharing them. By The Light Of A Super Moon. Now you are showing us your artistic talents, not just what that P900 can do. It sure is an amazing camera and the technology has certainly come a long way. Looks like our next camera could be one of those. There have been rumours of Canon coming out with one to match or exceed the capability of the P900, but it is clear that in the right hands that the P900 does an awesome job. Adrian, COOOOL pics cheers Pete. The Super Moon is approx 14% larger and 30% brighter than the average run of the mill full moon but I doubt that many people would notice. Most may think it is brighter than what they are used to seeing. Thanks for the compliments but I think any talent I may have is about as slick as a rampaging bull elephant at Floriade. adrian ss wrote: The Super Moon is approx 14% larger and 30% brighter than the average run of the mill full moon but I doubt that many people would notice. Most may think it is brighter than what they are used to seeing. Adrian.. the camera may take some of the credit..
but you still take awesome pictures..
Next picture i would love to see from you.. is your sdc2300 and the gold its found. Hmmmmm. I sense a challenge Jen. It has some current situational difficulties. adrian ss wrote: Hmmmmm. I sense a challenge Jen. It has some current situational difficulties. In Vic.. its hard to detect, as the Mozzies are soo bad! So it will be a while before i go detecting i think..
Mike does want the 19inch zed coil.. Better buy heaps of mozzie off spray stufff.. The detector is great Jen although my finds to date are just coins n bits of jewellery, sinkers, fish hooks and bottle caps. That is one thing I like about the Infinium at the beach. It can ID bottle caps approx 85% of the time using the reverse discrimination. With or without discrimination, I still dig all targets inc the bottle caps. It is a pain but the only way to nail all good targets. 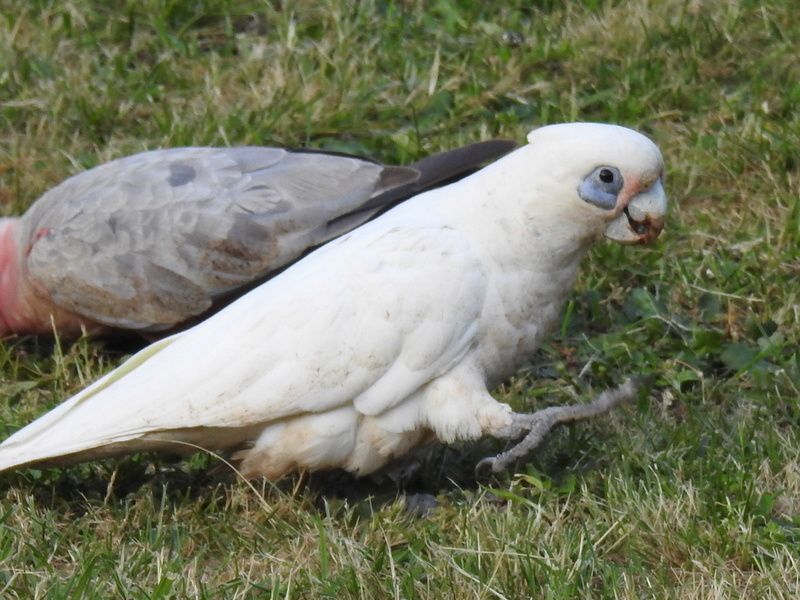 This Little Corella is not normally found in Canberra. It is a bit further East than where it should be yet here it is in my back yard. There is a pair of them but they nicked off before I could get a shot of both in one frame.